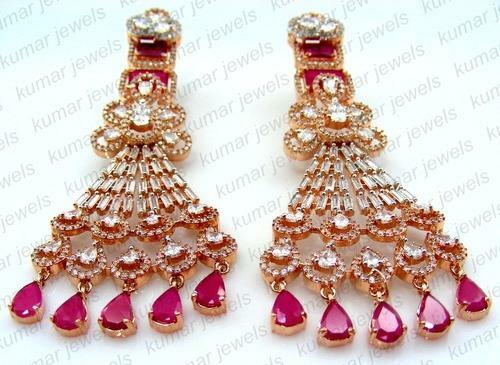 We are the leading manufacturers and exporters of Newly Designer Semi Precious Ruby Earrings. With our expert designers, we are engaged in manufacturing, supplying, and exporting all kind of jewelry. Our extensive product range includes Antique Rings, Antique Pendant Sets, Antique Earrings, Kundan Earrings, Kashmiri Style Earrings and Antique Bracelets. Owing to the attractive designs and fabulous finishing, these are in high demand in the domestic as well as international market. Apart from this, we also offer Golden Leaf Rama Green Stone, Fancy Jhumki, Fashion Earrings, Diamond Style 22karat Gold Plating, CZ Diamond Style Color Set, Meena and Lakh Bowl Mala. The ultimate house of brilliant craftsmanship providing an extensive collection of marvelous jewelry studded with precious stones. We are trusted for designing and developing authentic jewelry that is in high demand due to its smooth finish, fine polish, intricate artwork, perfect texture and sparkling lustre.